Q: In the statement issued by the Office of the US Trade Representative on Section 301 Action on July 10, China is accused of "stealing intellectual property rights". What is your comment? 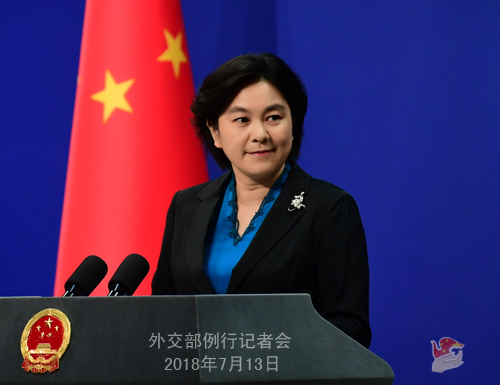 A: The Commerce Ministry of China has issued a statement on relevant issues, making clear China's stern position and refuting the groundless accusations made by the US side. The US has been accusing China of "stealing" intellectual property rights, but is short on delivering solid evidence. Facts speak louder than words. According to relevant statistics, the number of China's innovation-oriented companies ranks second worldwide, and China is second only to the US in the amount of received patent applications based on the Patent Cooperation Treaty. According to the World Intellectual Property Indicators report by the World Intellectual Property Organization (WIPO) in December 2017, China's State Intellectual Property Office received more than 1.3 million invention patent applications, ranking the first in the world for the seventh consecutive year and exceeding the total of those received by patent authorities in the US, Japan, the ROK and Europe. China is expected to receive the largest number of international patent applications in the next three years. All these show that China has already become a major power in terms of independently creating intellectual property rights. Meanwhile, the intellectual property royalties paid by China reached 28.6 billion US dollars in 2017, running a deficit of more than 20 billion US dollars. The intellectual property royalties paid to the US increased by 14%. All these figures and facts forcefully fight back the groundless IPR theft accusations on China. They make it clear that China is serious in respecting and protecting IPR, and our actions are effective. According to the latest Global Innovation Index (GII) released by the WIPO, China has been the only mid-income economy on the list of the world's 20 most innovative economies. It is the first time that China has been on the list. In terms of input, China ranks the second in the absolute amount of human capital and R&D investment. In terms of output, China boasts the largest amount of patent applications, scientific publications and scientific workers and researchers. China is emerging as a leader in global innovation and brand-building. I also want to stress that innovation and IPR are in no way the exclusive "patent" owned by the US only. No one has the monopoly over the application of IPR to promote social and economic development. Innovation and IPR shall be harnessed for the progress and benefit of all mankind, instead of being reduced to a tool used by the US to suppress other's development and serve its selfish interests. Q: According to reports, with the joint efforts of the Chinese and US law enforcement departments, Xu Chaofan, former head of the Kaiping sub-branch of the Bank of China (BOC) in Guangdong province was repatriated to China, 17 years after he fled to the US. Can you give us more details and elaborate on the efforts made by the Foreign Ministry in this regard? What is your comment on the current law enforcement cooperation between China and the US? A: On July 11, 2018, thanks to the coordination of the Fugitive Repatriation and Asset Recovery Office of the Central Anti-Corruption Coordination Group and the concerted efforts of the Chinese and US law enforcement departments, Xu Chaofan, a suspect of the abuse-of-power crime was forced to be repatriated to China, 17 years after he fled to the US. Xu Chaofan, former head of the Kaiping sub-branch of the BOC in Guangdong province, is suspected of corruption and embezzling about $485 million from the BOC. He fled to the US in 2001. The successful repatriation of Xu Chaofan represents an important outcome of the anti-corruption law enforcement cooperation between China and the US. He is the first suspect of the abuse-of-power crime repatriated from abroad after the establishment of the National Supervisory Commission. Since the 18th National Congress of the Communist Party of China (CPC), the CPC Central Committee with Comrade Xi Jinping at the core has been committed to pursuing and repatriating all the fugitives no matter which country they fled to and no matter how long it will take, stepping up international coordination on anti-corruption comprehensive law enforcement and keeping strengthening the deterrence on corrupt criminals. 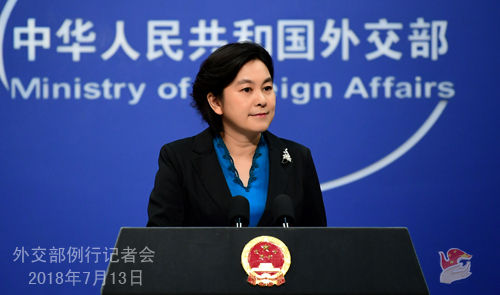 The Foreign Ministry and the Chinese diplomatic missions in the US attach great importance to fighting corruption, pursuing international fugitives and recovering illicit gains. They have been going all out to cooperate and coordinate with the competent authorities at home to make efforts to prioritize the case of Xu Chaofan under the framework of the China-US Joint Liaison Group on Law Enforcement Cooperation and create enabling conditions for his successful repatriation. The Foreign Ministry and the Chinese diplomatic missions will continue to make utmost efforts to promote international anti-corruption cooperation, weave a closely-knit "Sky Net", and make contributions to China's anti-corruption campaign. Q: According to some US media, China will take other countermeasures against the United States, such as prolonging the customs clearance process of the US goods and slowing down the review and approval for the mergers of the US enterprises. Can you confirm this? Will the Chinese side target the US enterprises? A: As to what countermeasures the Chinese side will take, the Commerce Ministry will deal with it in a proper manner. I only want to stress that the counteractions you experience depend on the actions you exert. The Chinese government will safeguard its own legitimate and legal rights and interests. 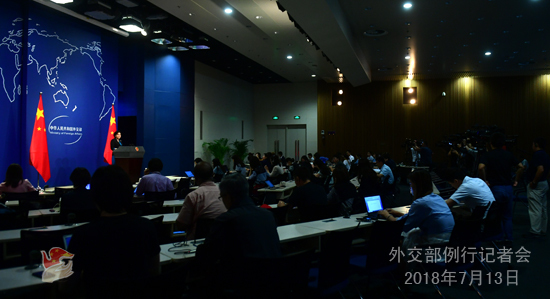 Q: Recently the US Treasury Secretary said that if the Chinese side makes structural changes, the US side is willing to discuss the relevant issues with China. What is your comment? Does this mean the US hopes that China could re-propose the trade talks? A: The Spokesperson of China's Commerce Ministry has responded to relevant questions. The trade talks should be premised on credibility.